I found this wine at Costco. It was recommended by their store wine buyer when he heard what kind of wine I was looking for. I was in search of an aperitif (sweeter wine) for Mother’s Day that would go well with a variety of dishes. I’m usually not a sweet wine drinker, but I loved this wine. It was so refreshing, just what the description said it would be. 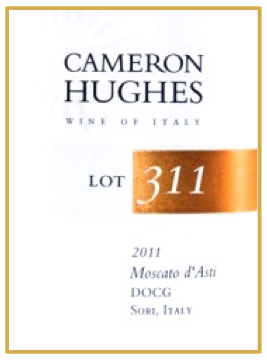 Cameron HughesLot 311 Moscato d’ Asti 2011 is distributed exclusively by Cameron Hughes Wine. Cameron Hughes, founded in 2001, makes, imports, and distributes ultra-premium wines nationally, that is most often found in food chains, grocery stores, restaurants and online. Their main focus is to bring exceptional wines to the ordinary wine drinker at reasonable prices. They do this by partnering with the finest growers and wineries in the world, making it possible for them to deliver consistently high-quality wines. Because of this Cameron Hughes is a highly regarded brand in the wine industry. Moscato d’Asti is referred to as an aromatic wine because of the aromas and perfumes of the grapes. The wine it produces has the same perfumes and aromas. In other words, it delivers what it promises. 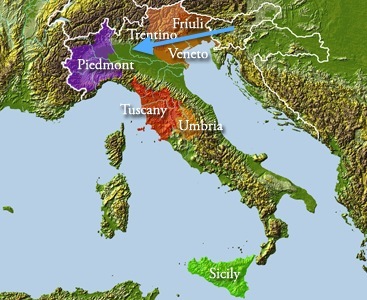 Moscato d’Asti wine grapes are found in the southern part of Piedmont Italy. This particular winemaker for Cameron Hughes has been making wine for four generations. An interesting fact about Cameron Hughes Wine is their a strong commitment and belief that it is important to give back to the community. They donate 10% of the proceeds from their wine tastings events to the Leukemia & Lymphoma Society (LLS). They also support a variety of charitable, educational, and other non-profit organizations by donating their wine for fundraising purposes. You can find Cameron Hughes Lot 311 on their website or at wine.com, totalwines.com, bevmo.com, costco.com, CostPlus/World Market and any good wine purveyor. If you enjoyed reading about this Cameron Hughes Lot 311 Moscato d’Asti, check out Saint James Raspberry Dessert Wine, R.L. Buller and Son Fine Muscat: and Pineau des Charentes 2010.